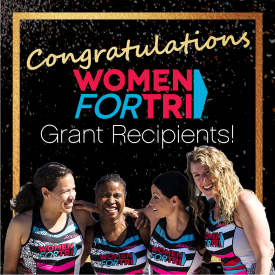 TAMPA, Fla. – Women For Tri®, a program of the IRONMAN Foundation®, today announced the distribution of grants to 28 triathlon clubs in the United States, Australia, New Zealand and China. This year, Women For Tri will again offer multiple grants of up to $2,500 per grant for triathlon clubs that will utilize the funds to support women’s engagement initiatives, including bringing first-timers into the sport. Since the program’s inception in 2016 more than $248,000 has been awarded. To learn more about Women For Tri, please visit www.womenfortri.com or contact womenfortri@ironman.com. To join the Women For Tri community online, visit www.facebook.com/groups/WomenForTri/. For media related inquiries, please contact press@ironman.com. Women For Tri®, a program of The IRONMAN Foundation launched by IRONMAN in 2015, works to increase female participation at all levels of triathlon. The program seeks to identify and diminish primary barriers to entry and mobilize triathlon advocates to encourage and engage female athletes across all race distances and representing all athletic abilities. Since inception, over $248,000 in grants have been awarded to triathlon clubs supporting female participation initiatives. Women For Tri embodies the heart and soul of what makes the sport so rewarding: testing your ability, overcoming challenges, and realizing the full depth of your potential in the most widely recognized test of endurance – triathlon. Learn more at www.womenfortri.com and join the Women For Tri online community of 45,000+ female triathletes at www.facebook.com/groups/WomenForTri.